Garrett became a CERTIFIED FINANCIAL PLANNER over two and half decades ago after graduation from the college of Financial Planning. Before entering the field of finance he attended graduate school at the University of Iowa and obtained an undergraduate degree from UK, where he was the university's first SEC Champion in wrestling. Garrett has been successfully advising clients and friends for over 30 years. 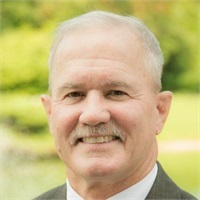 He specializes in 403(b) retirement plans for University of Kentucky faculty and staff although his expertise encompasses plans at other institutions. His attention to detail and emphasis on services to clients has built him a stellar reputation amongst industry peers. Outside the office, Garrett coaches wrestling at Henry clay HS where he has maintained his position for nearly 30 years. His passion for our armed forces has motivated Garrett to become a Guardian on Honor flights, a charity that escorts WWII veterans to their memorial in Washington DC. Garrett formerly served as President of the K club as well as on the University of Kentucky's Athletic board. He is currently a board member of Spindletop Hall.